It's very important to choose the right topwater lure. With a seemingly endless supply of lures available, it can become difficult to simplify your selection process. 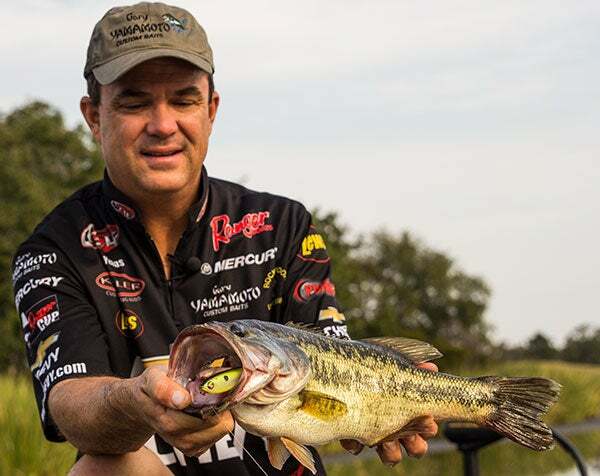 Before your brain starts turning circles and you break out in nervous cold sweats, consider advice from a former Bassmaster Classic Champion. FLW Tour pro Jay Yelas primarily relies on popping and walking topwater lures for a large part of his fall topwater fishing. There are, however, several factors that influence his decision to use each type. Target casting a topwater popper to specific pieces of shallow cover has produced hundreds, if not thousands, of quality bass for Yelas throughout his career. As the cooler water temperatures eventually spur a massive shallow water shad migration in the fall, a popper like the Yamamoto Shibuki is one of his ultimate confidence lures. Topwater poppers such as the Yamamoto Shibuki are excellent fall bass lures, especially under the right circumstances. "I've really fallen in love with the Shibuki," Yelas said. "Its color schemes are incredibly realistic and most importantly, it's totally fishable right out of the package. It has a much different action than many popping baits on the market and it flat-out catches bass." As with any bass fishing technique, not all conditions are ideal for topwater poppers. There are 5 situations in which Yelas reaches for his Shibuki. You're fishing for numbers—"Topwater poppers will catch a lot of bass in the fall when other presentations fall short," Yelas said. "You'll still catch a big one every now and then, but it's a great option for filling your limit. If I'm fishing on lakes where 10 to 12-pound limits win tournaments, you'll definitely see a popper on my front deck." Try this: Instead of the popular "twitch, twitch, pause" retrieve, make your popper walk. After each quick, downward twitch of the rod, give the lure some extra slack to make it slash side-to-side. This can be very effective for pressured bass. Choppy water—"In windy conditions, you want to use a topwater lure that will make a lot of commotion because choppy water makes it hard for bass to locate a subtle presentation," Yelas said. "I've found walking baits to be a bit too quiet. You'll still get blowups on walking baits, but the bass will miss it a lot. Poppers let bass know exactly where your lure is." Small forage—"If you're noticing a lot of really small baitfish on your fishery, it's a dead giveaway to switch to a popping topwater," Yelas said. "Fall bass get very size-specific when it comes to shad, and a big walking bait is going to look a little suspicious to them. It's all about matching the hatch—I know we say it a lot, but it's a fundamental key to fishing—especially in the fall." Cooler water temperatures—"When the water temperatures dip down into the low 60s or high 50s, it's hard to beat a popper," Yelas said. "The bass aren't as active in this temperature range, so a slow presentation is essential. You have to be patient because some of your best bites will come on a long pause. After twitching the lure a few times, I like to let it sit until the ripples go away. It seems like an eternity, but it can catch some great bass." Target casting—"Poppers are outstanding for casting to shallow cover, whether I'm skipping them underneath docks or searching for subtle underwater cover with my Typhoon sunglasses," Yelas said. "When bass are holding tight to cover, they don't always attack your lure on a quick retrieve, and popping-style topwaters let you stay in the most productive strike zones longer." A lot of tournaments are won on walking topwater lures, and for good reason—they catch big bass. It takes a little practice to master the popular "walk-the-dog" cadence, but when you do, you'll become a much more versatile angler. "When choosing a walking topwater bait, you want something that casts well and walks easily," Yelas said. "A lot of walking topwater lures require special knots or swivels in order to walk well, but the Yamamoto Tate'walks like a dream with a simple Palomar knot. Even in windy conditions, it casts like a rocket, which makes it especially deadly on schooling bass." Walking topwater lures shine in open water situations. Whether you're searching for fish or casting to open water, their ability to glide quickly on the water's surface increases angling efficiency. Yelas uses these lures in 5 different scenarios. Do the fish keep missing your lure? Don't worry, it even happens to the pros. Upon a missed blowup, Yelas suggests keeping your lure totally still for 5 seconds before continuing your cadence. This gives the fish time to regroup, re-energize and attack it a second time. Calm water—"Walking baits are best in slick or slightly rippled water," Yelas said. "The noise of a popper can spook fish in calm water, so the more subtle, gliding action of walking baits works best. Although they're not as noisy, bass will travel a very long way to attack it, especially in clear water conditions." Schooling bass—"When you see bass schooling in open water and blowing up everywhere, you need to have a walking bait in your hand," Yelas said. "They cast so much better than poppers, so you can reach fish 40 yards away from you. They also emulate a fleeing shad very well, which triggers a schooling bass' instinct to attack." Warmer water temperatures—"When the topwater bite is really on, a walking topwater is the way to go," Yelas said. "You don't have to worry about leaving it in one place for too long, so you can cover a lot of water and expect a lot of bites. Until the water temperatures get in the low 60s, they're and excellent choice." Covering water—"Bass don't always show themselves in the fall, so it's important to use a walking topwater to cover water when searching for active fish," Yelas said. "They allow you to put the trolling motor into high-gear and make long, quartering casts to the bank. You can cover a whole pocket in no time at all with something as efficient as a walking topwater." Every angler is different when it comes to selecting certain color schemes for topwater lures. Yelas prefers to keep things simple, so he doesn't get too carried away with color selection. Throughout his career, he's found 5 colors that continuously produce big bass. Chrome/Pearlescent—"When the water is super clear and the bass can see a mile, these are my two go-to colors," Yelas said. "They're both very simple, yet accurate imitations of various shad species, so the bass don't get leery." White—"This is usually the color I use when I'm first searching for a topwater bite," Yelas said. "I'll generally use this color before anything else. White is a great topwater color for almost every condition, but it's especially effective on cloudy days or in lowlight conditions." Black—"For whatever reason, Northern bass just love all-black topwater baits," Yelas said. "If you fish up there a lot, it's definitely something you need to try. Black topwaters are also great for night fishing on both big lakes and ponds." Chartreuse—"If you're fishing around lily pads or hear frogs croaking around you, a chartreuse topwater is a must-have," Yelas said. "A lot of frogs have a yellow hue to their bellies, so it's a very natural presentation. It also works very well for smallmouth because they love anything chartreuse." Instead of stressing about your topwater lure selection this fall, remember Yelas' tips and fish with confidence. Not only will you avoid constant second-guessing and re-tying, but you'll also save a lot of fishing time.